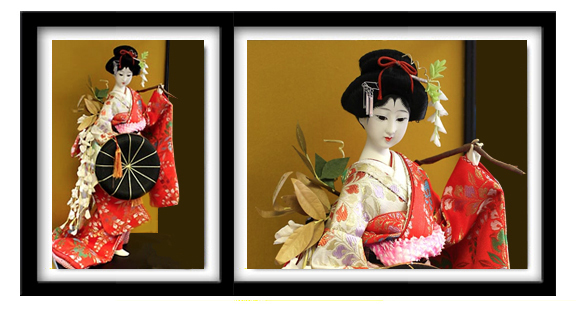 Isho Ningyo (dolls of folk culture) usually represents a Japanese folk tale or myth. These dolls are among my favorites. Shiokumi (right) – are “salt-scoopers” who carry seawater to make salt. A poet was exiled to the seashore where he met two beautiful sisters and courted them both in secret. The day came when he was forgiven and asked to return to the imperial court. Unable to choose between the sisters, he fled leaving them behind behind with only his gold hat (eboshi). 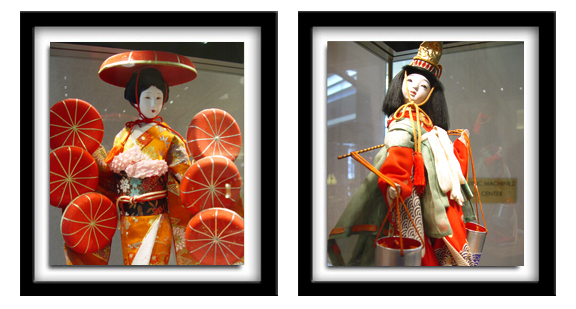 Musume Dojoji (left) – A young hat seller became enraged after she was seduced by a man who was really a priest and had no desire to marry. As she whirled in dance her hats became scales and she turned into a serpent-woman. Afraid, the priest hid under a bell. But the fire from her breath melted the bell and he was burned alive. 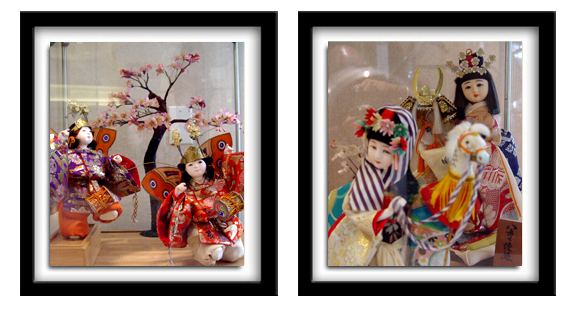 Butterfly Dancers (left) – a delightful pair of Japanese dancer dolls. A dance of children dressed as birds and butterflies is described in the Tale of the Genji. Spring Horse Doll (right, front) – this festively dressed maiden holds a white toy horse which said to be the offspring of a mare and a dragon, a symbol of power and fertility. Princess Yaegaki (right, rear) – holds a helmet draped with the silver hair of a spirit fox. This Kitsune, was sent by the gods to guide Yaegaki across a half frozen lake. Upon reaching the far shore she successfully saved her lover from a terrible fate. Fuji Musume (above) A painting of maiden, caught the eye of a young man. He stopped every day to gaze upon her image. Musume was infatuated with him too. Weeks past, then suddenly he stopped coming. Heartbroken, she left her portrait to search for him. But he was nowhere to be found. Alone, she returned to her painting.